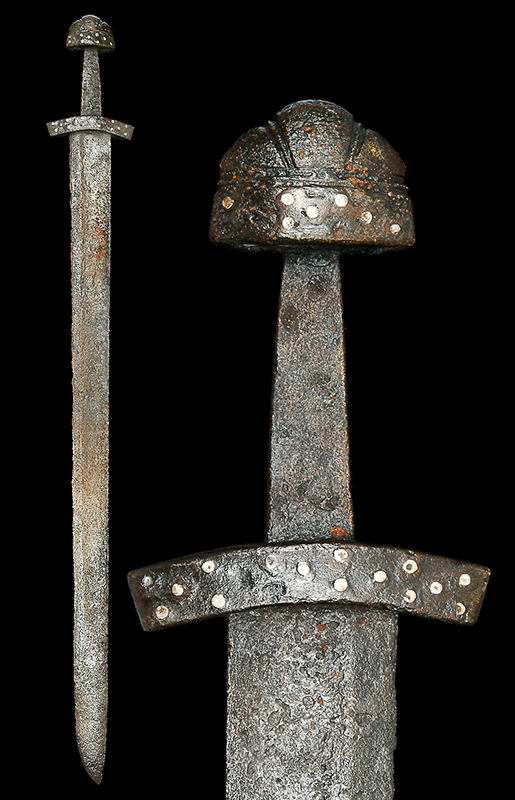 Recently I've been posting a lot of Viking swords (or those in the Viking Age style) to our Facebook Page. 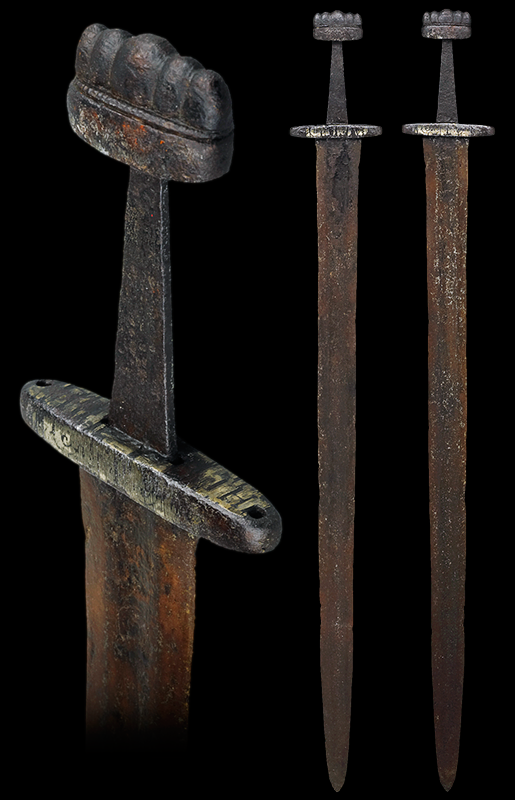 Many of these swords are from auction houses, arms and armour purveyors, museums, private sales, or are otherwise lesser known examples compared to the more commonly shared ones. Those that I've included that are more recognizable are (hopefully) shown in a different manner than what would typically be seen published in the more common source material that we've all seen a million times. Shown here, in scale to one another, are just 30 of the ones we've shared. Each one has a high-resolution photo, a description, and measurements included. Note that the swords were all photographed at different times and in different places so their individual perspectives may differ slightly. 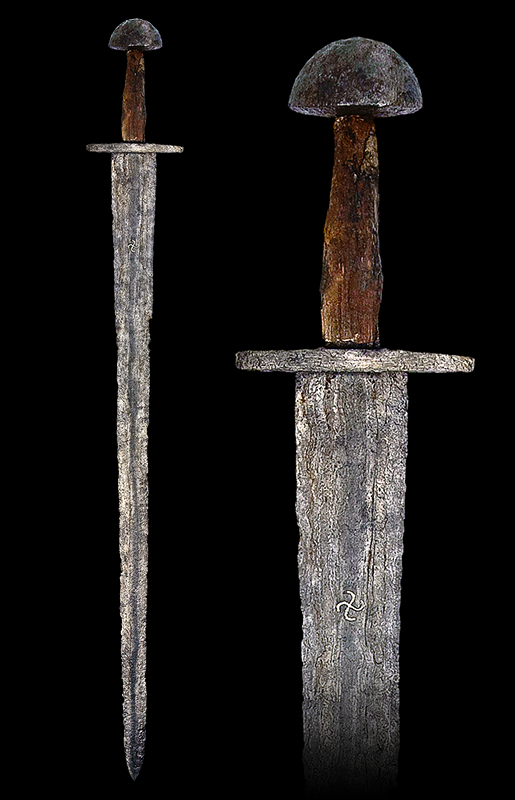 You can see much higher-resolution versions in our Viking Age Swords album should you wish to do so. The intent of posting these samples was to encourage discussion and critique for them. Some are absolutely assuredly authentic examples. Others are questionable as to them being authentic samples from the Viking Age. Some have tell-tale signs of artificial aging, others have questionable provenance. It's been a taboo subject to discuss openly on the Internet. I'm not entirely sure why, as I think this is what encourages all of us to have an open mind when viewing photos of objects. Almost all of us are not experts (I certainly am not) and so we rely on those more experienced alongside the collective knowledge of the community to create a knowledge base that we can use to assess what we see. Further, we want to encourage those selling such items to stay diligent in their efforts to properly and completely assess and identify these objects. In the following series of posts, I'll pull some of the images from our Facebook page and share them here in hopes of encouraging some additional dialogue. I understand that we really don't have many (if any) experts in the field on this site. Most of us are enthusiasts with an interest in the subject. Others may have a lot of hands-on experience with original swords and have gained quite a lot of knowledge from their experiences. Still, others, have even more knowledge gained from their many hours of hands-on experience, countless hours of reading, and discussions with others knowledgeable in the field. It's the diversity of the community that creates an environment well suited for dialogue and learning. Please don't be afraid to ask questions, point out concerns, or even express appreciation of an item! There shouldn't be fear of being wrong or, worse, a fear of debate. These things are each healthy and necessary things for learning. Any question can be asked or any concern can be raised when couched in the appropriate context. Please take care to provide context. 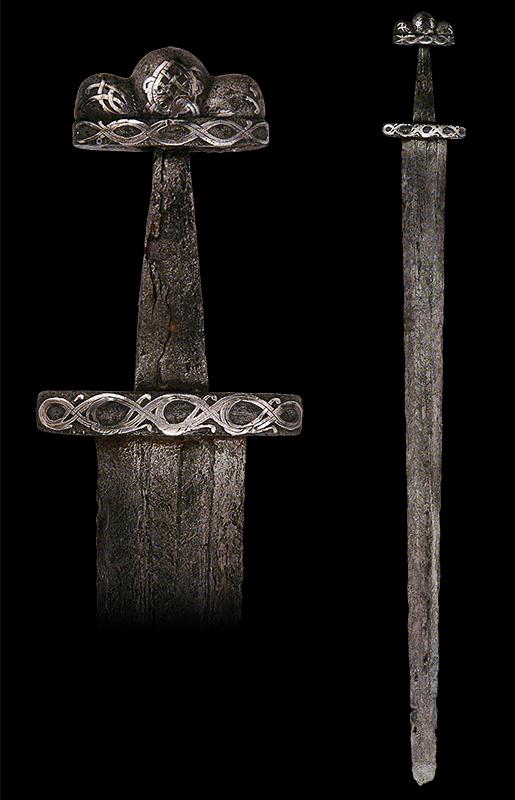 Pommel and cross-guard each retaining traces of silver and gold inlaid Nordic ornaments. The blade with pattern-welded shallow central fuller. 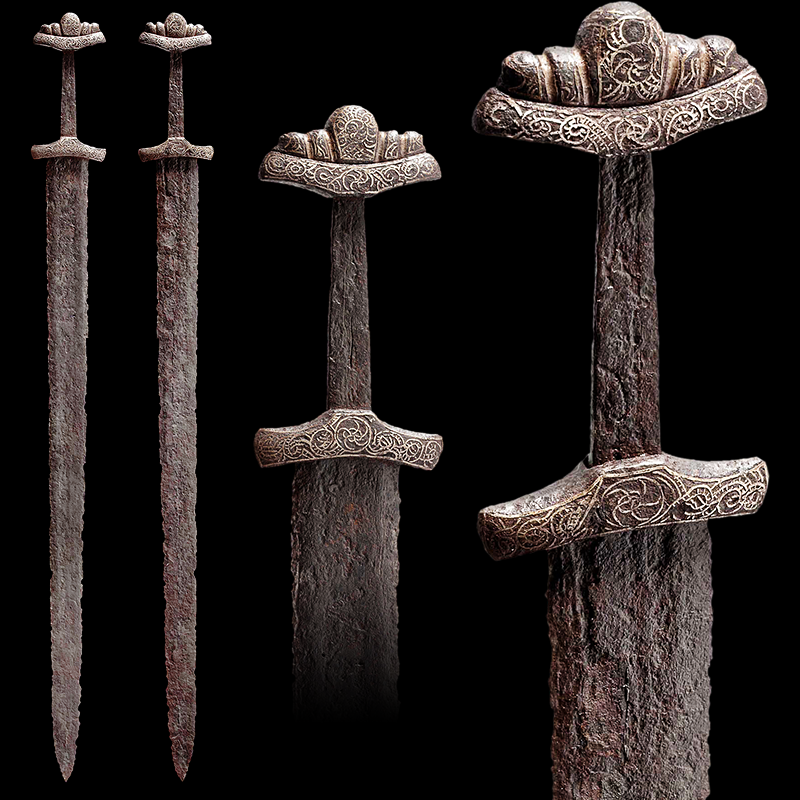 Pommel and cross-guard each retraining traces of gold and silver inlaid Nordic ornaments. Blade with pattern-welded shallow, central fuller with traces of an inscription. Broad double-edged blade with a flat fuller on each side. 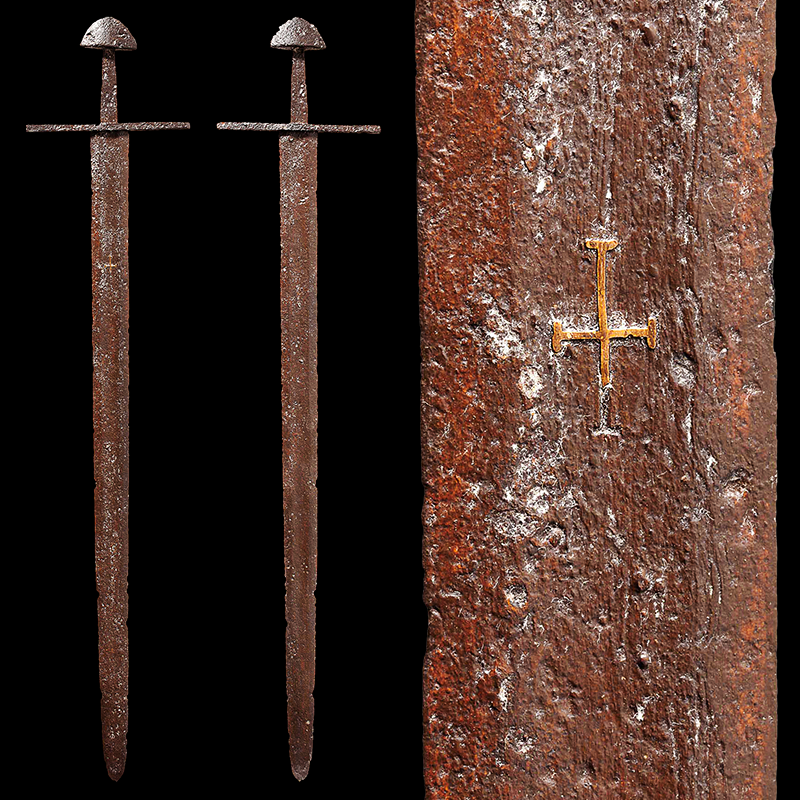 The upper quarter of the blade with plain straight-armed cross inlaid in bronze on both sides. Short, slightly curved cross-guard, tapered tang with pommel made in two pieces. Hilt entirely covered with silver and decorated with concentric circles. 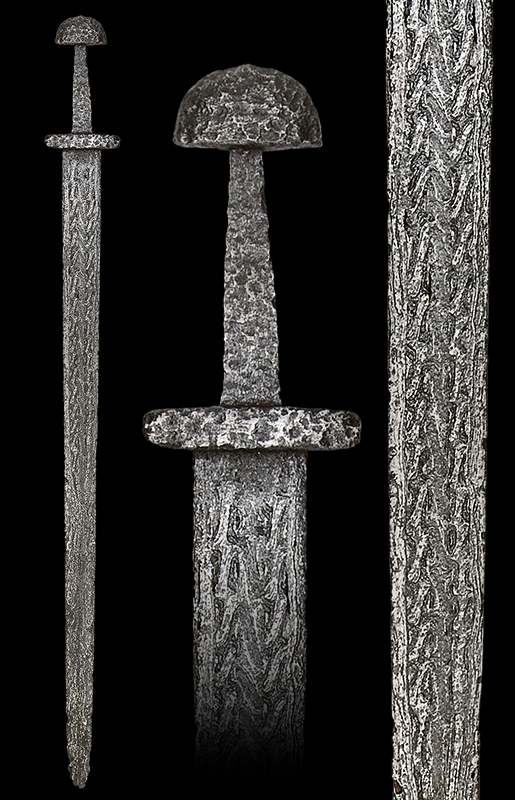 In excavated condition, with tapering double-edged blade (lower third missing) with shallow central fuller over its entire length on both sides, hilt comprising thick ovoidal cross-piece decorated with numerous small holes against a vertically hatched ground and retaining faint traces of original silver inlay, flat tapering tang, and two-piece pommel of trilobate form decorated en suite with the cross-piece. Wide double-edged sword, both sides with a shallow fuller. One side of the blade has n inscription, “+ VLFBEHRT *”. 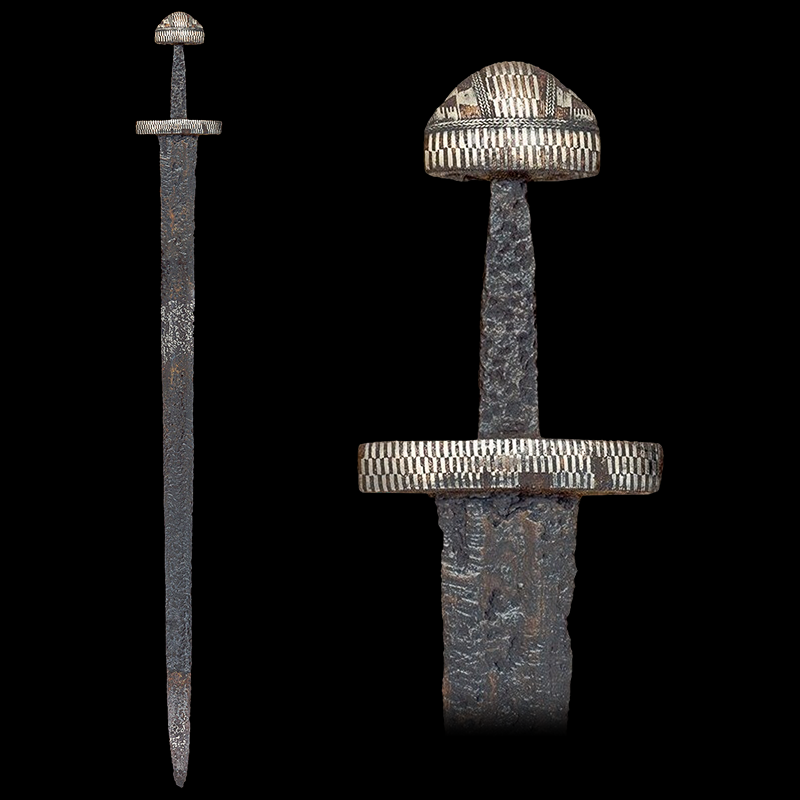 Short, slightly curved cross-guard and two-part pommel of fine ornamental silver inlay. Strong, slightly tapered tang. An exceptional, magnificent weapon of a high-ranking warrior. Possibly E. Juste; comte de Nieuwerkerke; Sir Richard Wallace, August 1871. Straight 75.2 cm (30") double-edged blade with central fuller. Thick lozenge-form cross-guard, the outer edges inlaid with gold-colored metal wire in a striped design. Two-piece pommel, the triangular upper section retaining a single small area retaining the striped wire decoration. Condition: Relic condition overall. Cross-guard retains much of the wire inlay. 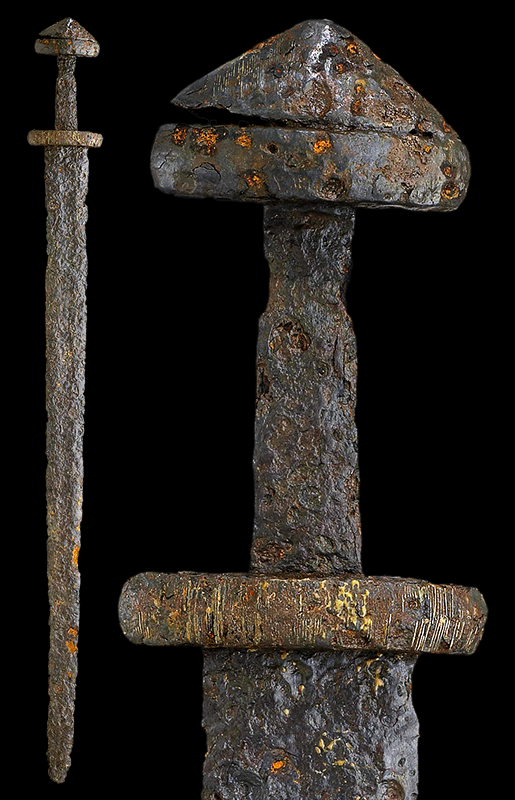 Note: A typical example of Petersen's Type H sword, dated by him to 800-950. 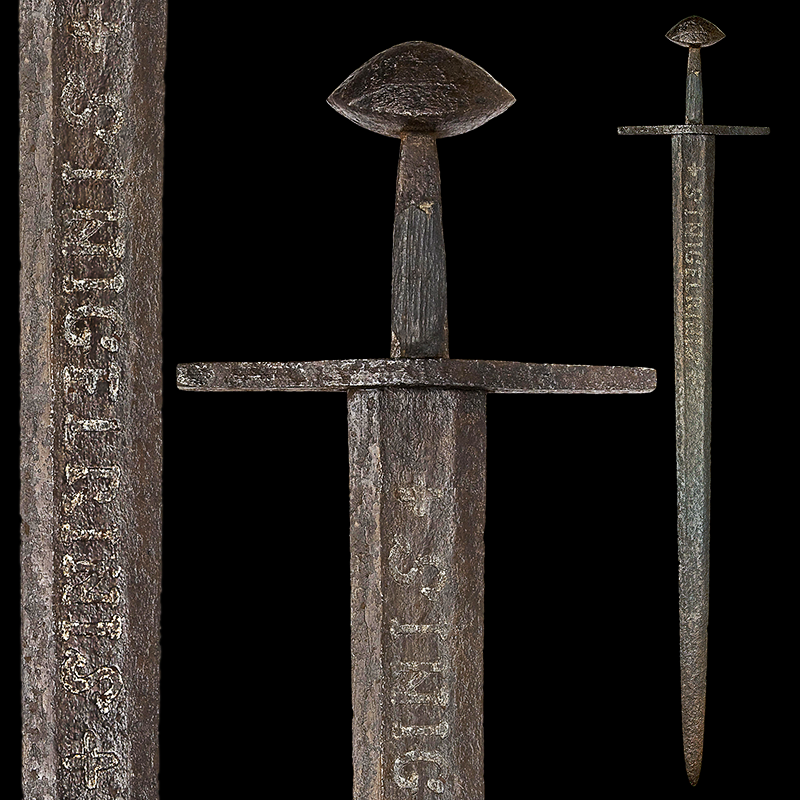 See "The Norwegian Viking Sword" by Jan Petersen. Double-edged blade with a slightly rounded point and shallow fuller on each side. Straight-armed cross inlaid on one side, made either of brass or bronze. Straight, extended quillons of square cross-section. Sturdy, slightly tapered tang with a flattened, semi-circular pommel. With broad slightly tapering blade formed on each face with a single pattern-welded fuller, hilt of solid silver comprising trilobate pommel and short straight guards each formed with a raised transverse band incised around a series of equi-spaced dots with concentric circles separated by trios of vertical lines, and straight-sided of dark horn ﬂaring to its ends and formed with four raised transverse bands in imitation of bindings. 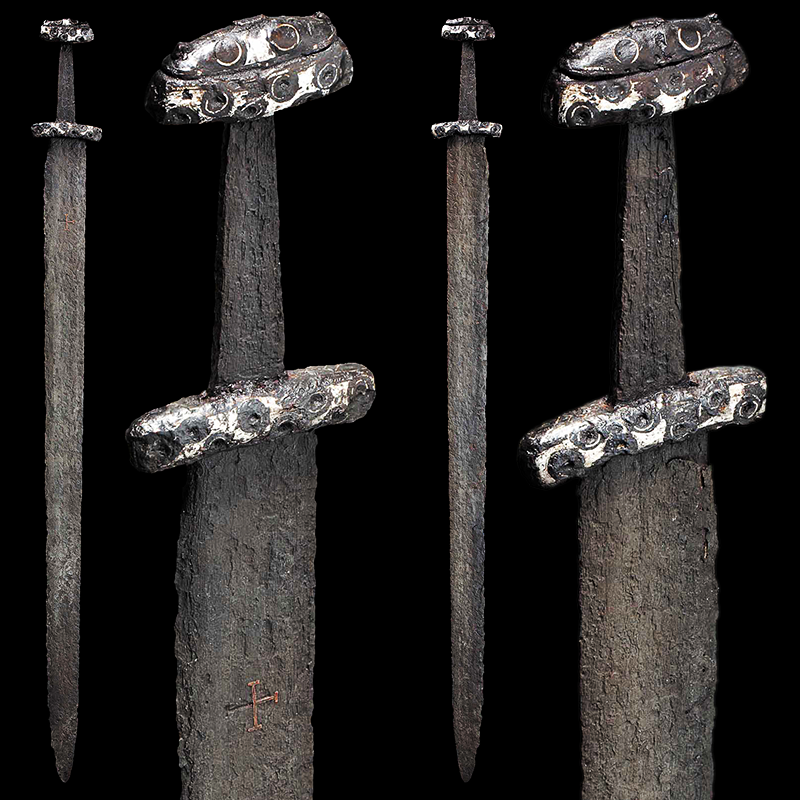 The double-edged blade with broad, well-preserved cutting edges and wide fullers, one side of the blade being inlaid for almost its entire width with a Celtic cross, the arms of the cross formed of twisted gold wire and the decorative strap-work and circle formed of silver wire. The hilt comprising a straight, stout cross-guard, a broad, sturdy tang and a three-lobed pommel, the central lobe very pronounced, that is riveted to the upper guard. The lateral faces of the hilt inlaid with a series of isosceles triangles in silver; those on the guards in counterchanged strips and all edged with lines of twisted gold wire. 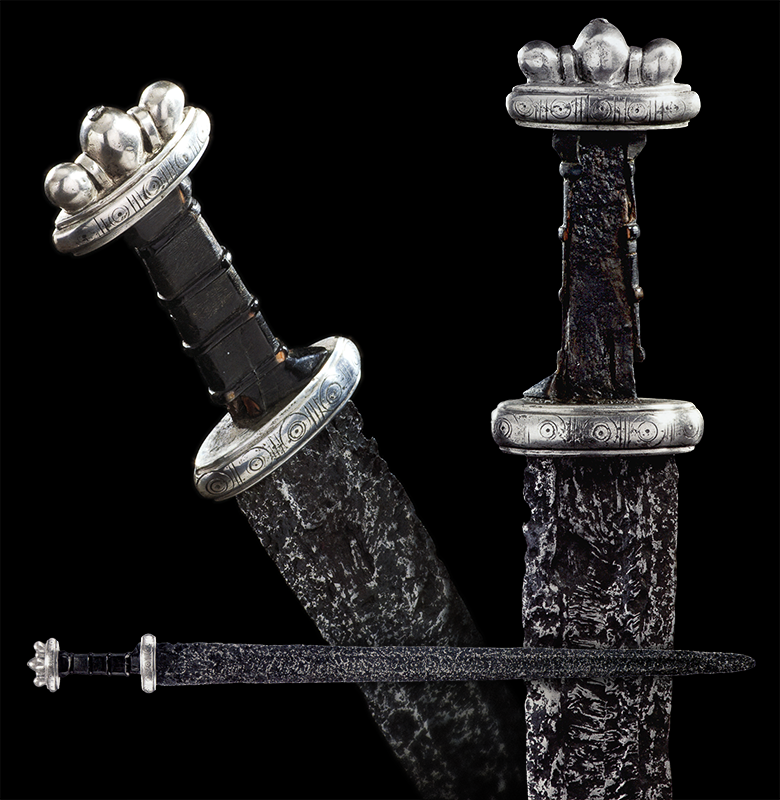 Jan Petersen did not designate a type to this style of hilt in his masterly and comprehensive study of hilt-forms, but there is no doubt this weapon belongs to the group of magnificent swords that have been mainly found in the eastern Baltic region. To date, a total of seventeen weapons of this type are known, all from Finland. 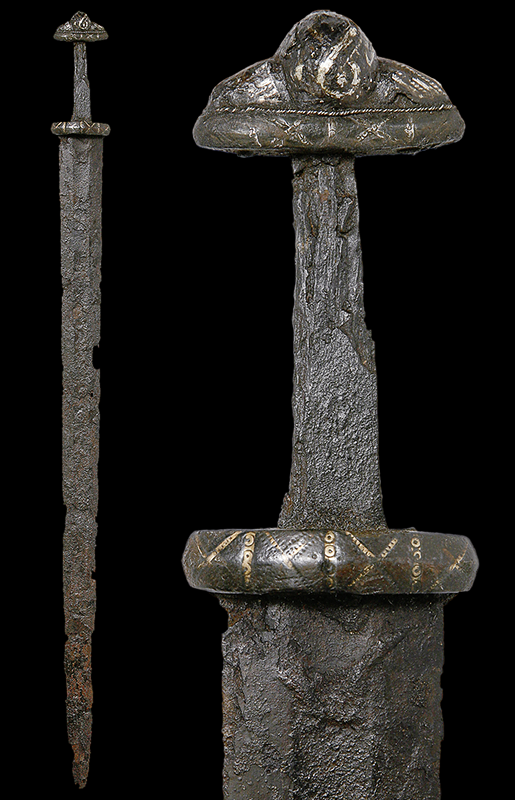 They all have silver decorated hilts, with most exhibiting silver ornament on the grips, the example from Leikkimäki, Kokemäki (Suomen kansallismuse, Helsinki, NM 1174:1) having Urnes-style animals with spirals and palmettes and gold inlay on both sides of the blade. Another member of this select group is in the Musée de l'Armée in Paris (Inv. No. JPO 2258). The outstanding decoration on the cross-guard, pommel and upper guard is virtually complete. Given that this weapon is almost certainly a grave-find, it is very uncommon to encounter this degree of survival of decoration. It is also extremely rare to see triangles decorating a sword hilt, although another example is known in a Russian collection. Inlaid diamond shapes are far more common as hilt decoration, a fine example being the 10th century sword from the River Witham, found opposite Monk’s Abbey and now in the British Museum (Inv. No. 1848, 10-21 1). 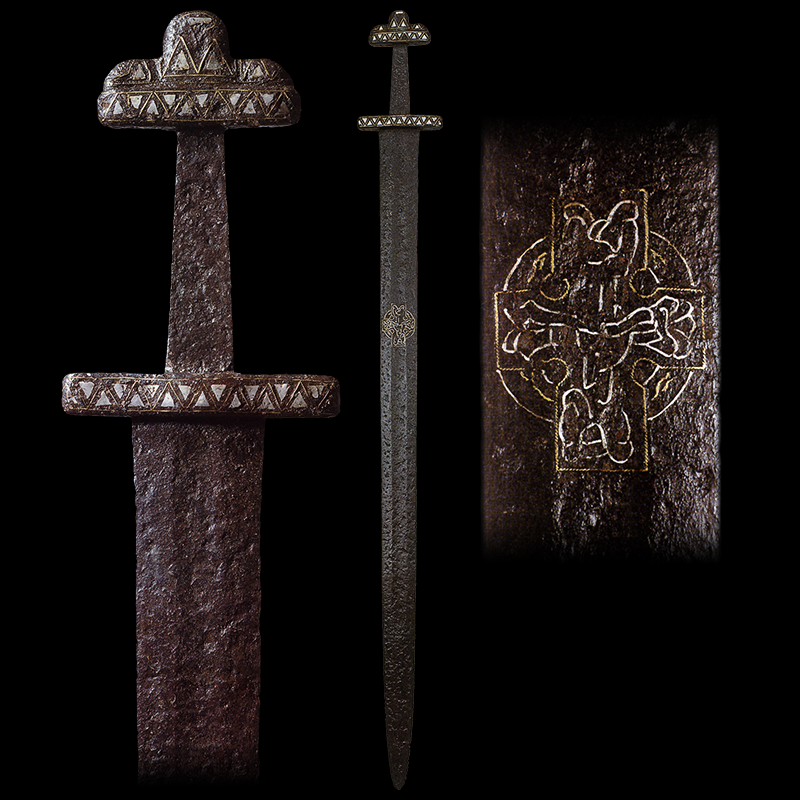 The use of the Celtic cross on the blade of a sword is a further extremely rare feature of our weapon and it serves to emphasize the importance of this remarkable and lovely sword. 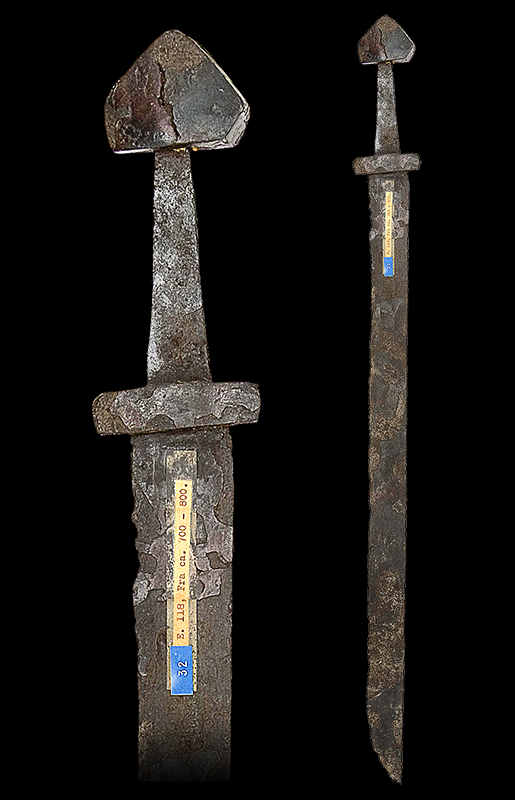 The quality, quantity and richness of the decoration upon this sword inevitably leads one to the conclusion that its owner was a chieftain or person of noble birth. 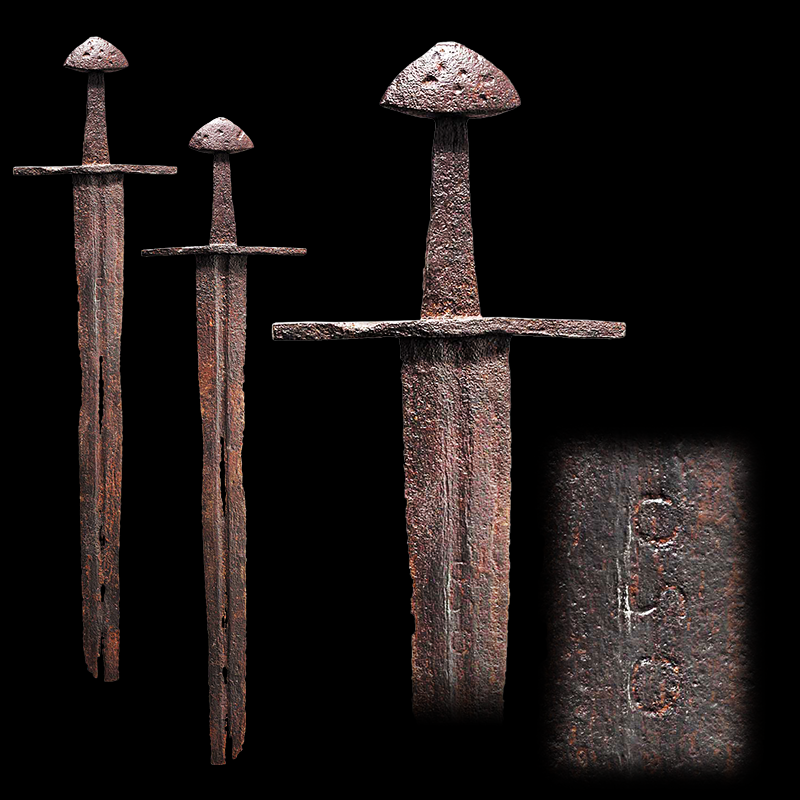 The blade is not pattern-welded but, instead, made up of a homogeneous billet of steel forged into shape, ground and polished: it may well have been imported from the region of the Rhineland. 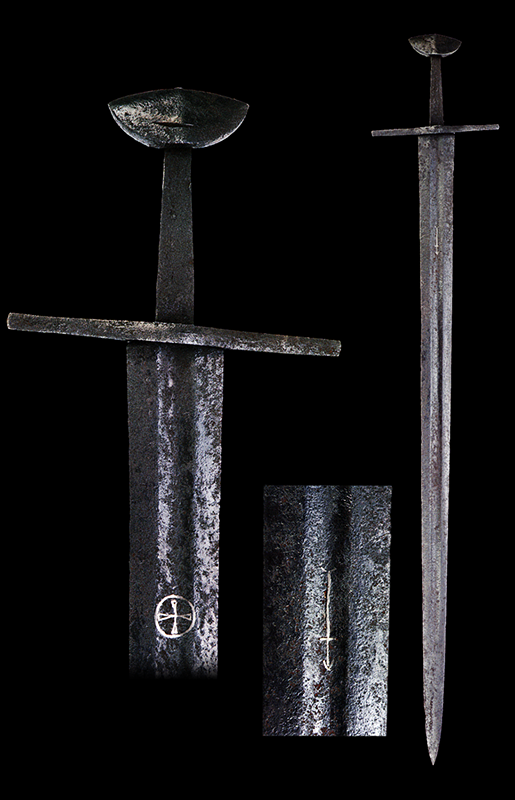 The forging of a blade was a skillful and complex procedure and most blades of the Viking Age were constructed using a process called pattern-welding. To achieve this process, bundles of iron rods with different properties and differing concentrations of trace elements were twisted together to form a rope-like bar, a procedure noted by the 9th century Arab scholar al-Kindi when he studied the construction of European blades. The bar was then heated and hammer-welded into one piece. Gradually, the blade would be fabricated to form the central fullers and both cutting edges. Rough grinding, shaping and final polishing would reveal the magical patterns, which would generally be of the ‘Blood-eddy’ form (Blodida, meaning interlinked swirls) or the ‘Ann’ configuration (Old Norse for the swathes of mown corn). Frequently, there would be a combination of both. Recent scientific research has shown that, often, three millimeters of hard steel was hammer-welded on to each cutting edge after forging in order to provide an excellent and robust cutting edge. --The Saga of the Icelanders, Ch. 136. The Old Norse sources contain very little information regarding the forging of sword blades and the stories are more fabulous than factual. However, combining that evidence with archaeological evidence tells us something of the craft-mystery of the weapon-smith. The sagas speak of the secrets of the smith being jealously guarded and the secrecy of his art associating him closely with supernatural powers. The sagas do, however, have many detailed references to sword testing, such as striking a blow at an anvil, to ensure the blade would not shatter or break. 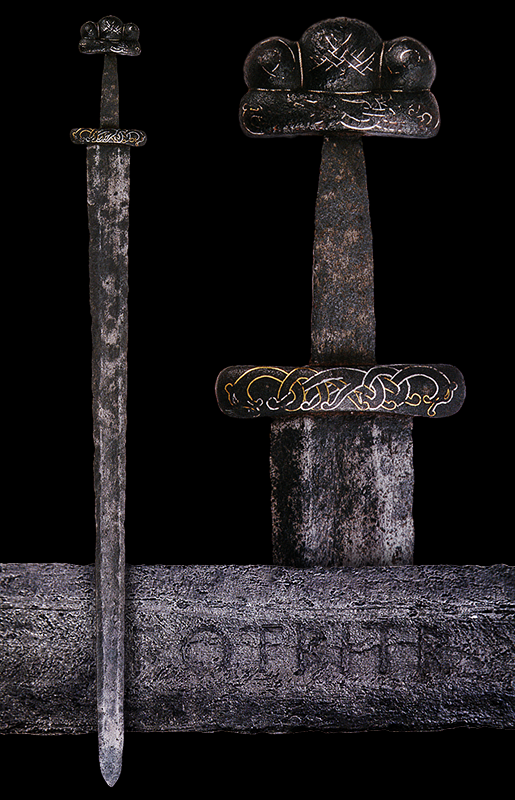 Wide, double-edged blade with a fuller on each side, shortened at the point, with inscription “O S O” on one side. Straight cross-guard widening at the ends and slightly reinforced languet. The conical tang with flattened pagoda-shaped pommel. In cleaned and conserved condition. 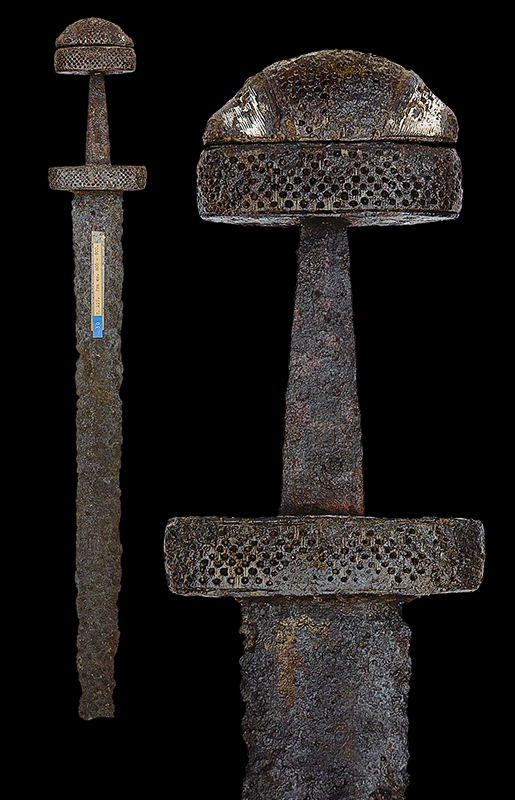 In excavated condition, with broad double-edged blade distinctly pattern-welded and with a shallow central fuller over much of its length on each side, hilt comprising thick ovoidal cross-piece, flat tapering tang, and pommel of "tea-cosy" form.